Motherwell manager Stephen Robinson has admitted that his team deserved nothing from the home match against Hibs on Saturday. The Steelmen were beaten 1-0 by the Edinburgh outfit, denting Motherwell's brilliant recent league run which had included six victories out of eight matches. "We got what we deserved, nothing," Robinson said. "We lacked a spark today. What Hibs did to us we've done to other teams. "We lost the physical battle today, they came out with every second ball. "People talk about how good a football team Hibs are. They did the free stuff better than us. "They picked out every loose ball, they won every header and I thought they deserved the result to be honest with you." Robinson said that Motherwell's below par display had seen several of the players looking at each other for a spark. "We're looking at Cadds is there a spark," he added. "We're looking at Moulty is there a spark, instead of people taking the bull by the horns and making it happen themselves. "Perhaps that's just the culmination of a difficult, difficult week for us where we've come out with two wins. "It did take a lot out of the boys and we'll regroup. It's not the end of the world, we're disappointed. "The thing is, we know we can be a hell of a lot better than that." 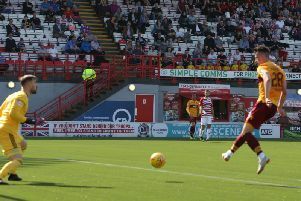 Motherwell had a second half penalty shout for an alleged handball against Hibs defender Marvin Bartley, but Robinson refused to blame that decision not being awarded for Motherwell's defeat. He added: "that certainly wasn't the reason we lost the game. "We had a chance when Demi (Lithuanian substitute Deimantas Petravicius) came on. I'm not sure if the keeper saved it or it hit off somebody. "We had a couple of half chances that we didn't take. But there wasn't a lot in the game if we're honest. "I thought they dominated the first 20 minutes but we weren't at the races today so we got what we deserved."